(Photo courtesy of Fortunascorner) President Assad seen accepting the new North Korean ambassador’s credentials. To his left is the Syrian Foreign Minister, Waleed Al-Mu’allim. The U.S. has been curiously mum about Dr. Assad’s expected summit with Kim Jon Un in Pyongyang ahead of the much-ballyhooed meeting with Trump in Singapore. Kim Jong Un, the North Korean leader, is fully aware of the American attitude toward Dr. Assad arising from the Syrian leader’s defeat of all NATO plots to oust him. Yet, he has shrewdly accepted Dr. Assad’s arrival to the North Korean capital a few days before the expected meeting in Singapore. So, what is the U.S. thinking? I had a short discussion with my source in Damascus the day before yesterday. While we could not speculate about the president’s thinking here, I got the impression that Moscow had a lot to do with the decision to meet up with Mr. Kim. I believe that Dr. Assad will pursue a similar line to F.M. Lavrov’s warning to the young Korean leader: “Be extremely careful” and “Don’t believe Trump calls the shots on this.” In other words, the “Libyan Model” which was famously announced by chicken-hawk John Bolton is very much relevant and that the U.S. will seek Kim’s ouster at the first opportunity. In other words, don’t give up your nuclear arsenal under any circumstances lest you find your favorite pistol shoved up a part of your body which rarely sees the sun. This is exactly what the U.S. is thinking. Certainly, nobody in Washington believes that the Syrian president is anxious to see detente between the U.S. and North Korea. The Syrian president’s trip is definitely intended to drive a wedge even deeper into the troubled relationship between the U.S. and North Korea. The Syrian president will tell Kim that the U.S. and its European and Gulf allies tried unsuccessfully to overthrow him and the Ba’ath Party. He will tell him about the mistakes Col. Qaddaafi made; the Mossadegh model; the Noriega model; the Maduro model; the Allende model……and the list goes on and on. None of this is lost on Kim Jong Un. But, the Syrian president may have much more to tell him about how the Zionist regime in Tel Aviv is seeking to monopolize nuclear weapons and technology for smaller state actors and how Zionism is controlling Trump’s behavior. The president will tell him that nothing is more menacing to the Zionist Apartheid State than the prospect of North Korean know-how transferring to powerful regional states like Iran. With Iran now verging out of the Iran Nuclear Deal due to American inconstancy, Kim cannot place even the slightest reliance on American promises. He must not fritter away the one ace-in-the-hole which he can play at any time to dispel the Yankee pest. American promises and agreements have proven to be ephemeral and, even, eel-like. The American National Security Advisor, John Bolton, who is known to oppose the overture to N. Korea, will be traveling with Mr. Trump to Singapore. This comes after several reports indicating that Bolton had been marginalized and uninvited to several NSC meetings concerning strategy for the upcoming talks with Mr. Kim. That he is now back n good odor with the president is an indication Mr. Trump wants his favorite Pit Bull to, perhaps, push the talks as much as possible toward total denuclearization. Once again, Dr. Assad, will deliver the warning about all that. Mr. Kim will listen carefully to what Dr. Assad has to say, after all, he is the Syrian leader who defeated his enemies’ schemes and machinations. We, at SyrPer, believe that nothing will alter North Korea’s nuclear agenda. Kim Jong Un will not give Trump much of anything. However, Korean analysis of Trump’s psychology indicates an American leader addicted to display, cultism, superficiality and self-importance. Kim will extract as many concessions as he can from Mr. Trump while playing along with an American-concocted veneer of success. Mr. Trump must not go back to Washington empty-handed. With most of the MSM up in arms over his presidency, Mr. Kim knows how desperate Trump’s regime is to project success in the eyes of American citizens, especially, those citizens who form Trump’s ever-dwindling base. Even Vladimir Putin is playing along with this scenario. He just announced to Russian news services that he was intent on making sure Mr. Trump was successful in his meeting with Mr. Kim. You can’t get better hot air than that. Trump now suspects that Russia will play a positive back-door game to insure a successful summit. Even China, anxious to shore up its economic relations with the U.S. can be expected to extol the results of the negotiations even though they might be nothing more than North Korea’s promise to temporize and delay for eternity that chimera we call denuclearization. Here’s a scene which will fill your hearts with gladness. Syrian security services discovered a huge arsenal of mortar shells, RPG rockets, medical supplies, grenades, ammunition cases and all the other goodies used by these terrorist apes to torment the simple people in the villages around Al-Rastan. And, by the way, the Homs-Hama highway has been open for use since last week when the last IED was disassembled. I asked 200 times for 200.000 Korean soldiers to defend Syria. My Sith powers are limited on this planet. I was noticing the exact same the last 2 days! No idea if I had anything to do with that. I did put some time into this on Twitter and I did make some alliances with “important people on Twitter”, those with millions of followers, example: Stephen King, he is really brave! I hope Kim give the technology for making missiles to Syria so SAA will not need more the SS300 from Russia. In any case a thank to Kim for his bravery. 38 North has two interesting articles up on the upcoming Kim-Trump summit……. Dennis Rodman will be attending the summit too, likely in support of Kim. “Deal With Turkey Threatens Trump’s Iran Strategy” Utter Spin and Rubbish. Syria, Turkey with the help of Russia and other allies. As seen at Canthama’s tweeter feed. – in Pyongyang ahead of Trump’s seminar with Kim in 5 days. 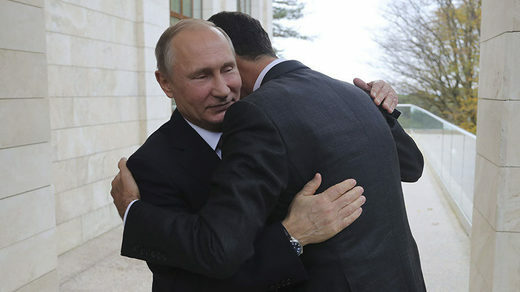 Wondering if Ziad also sees the brilliant mind of Putin at work here, orchestrating Dr. Assad’s entry to the stage of this world-watching event. Thanks, Ziad. 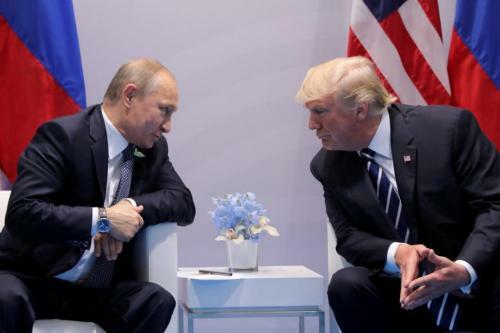 Putin Asked Austria To Set Up Summit With Trump In Vienna. Interesting event sequencing > Just a day after praising “courageous and mature” President Trump for his plans to meet with North Korea’s Kim Jong-Un – and reported The White House is planning summit between Trump & Putin, and then reported Dr. Assad to meet with Kim – now reporting Putin is seeking a meeting with Trump in Europe. All good trends. The World Empire PTBs must be screaming mad at this trend for peace in Syria and elsewhere. Mike. That’s all fine and good and I agree. But North Korea is starving. DPRK desperately wants the US to stop its semi-annual military exercises so they can properly sow and later harvest their crops instead of calling up reservists. I could envision a commitment to stop testing as long as the exercises are not held. Both sides could portray that as a victory without DPRK disarming and inviting the Libya option. Or they could denuclearize in exchange for a small tripwire garrison of Russian or Chinese troops. Is Putin Really Ditching Iran and Siding With Netanyahu in Syria? Dany Milaneh, Waseem Issa and Milad Ali. Hes awake now.. I am sure something is lost in the translation.. 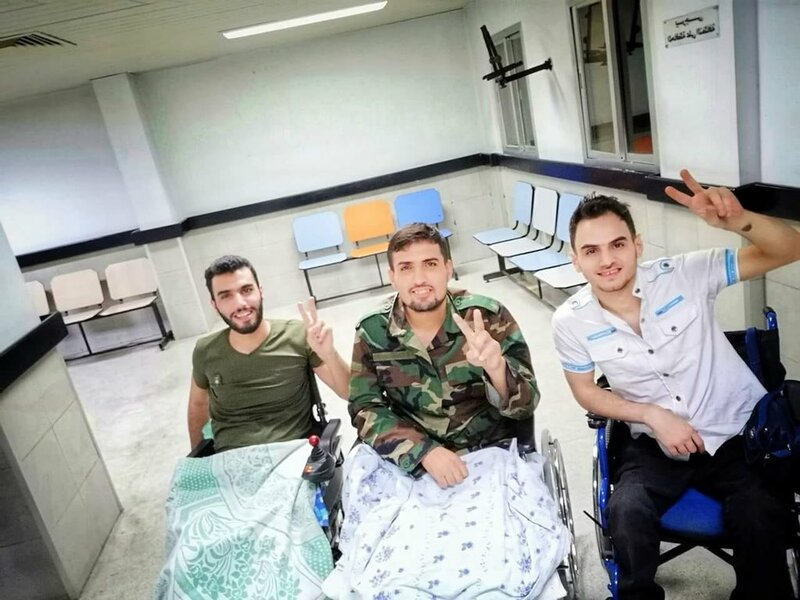 He was a reporter for the SAA and lost his legs. It appears Penny calling this ‘deal’ bs was correct (again). The Empire has been putting out alot of BS about supposed ‘deals’ that gives the illusion of imperial strength and control…. like the BS ‘deal’ that Russia was ditching Iran for israel. It appears that mbs is bad for business……….. There is a claim that mbs lives…………. Anyone have current info on how the ISIS infiltration attack on Albukamal is getting dealt with by the SAA. Have the infiltrated terrorrist forces been neutralized or pushed back over the river? Or is intense fighting still going on within the city? Tomorrow is the 51st anniversary of Israeli War Criminals deliberately murdering 34 American sailors on board the USS Liberty. One of the human beings the Israeli death squad fascist state murdered today. His name is Haytham Al-Jamal, 14 years old, he was killed by Israel forces in the Return March on AlQuds Day 8\6\2018! Nasrallah: If Israel wants a new phase in the war in Syria, after being defeated in the first phase, then bring it on. Haha…. Quite clearly saying it like it is. Sounds like Hezbollah is ready for the IDF. Repentant anti-Assad Syrian: Assad made us better human beings! Below is a link to pictures of what the Apartheid State does to protesting Palestinians. 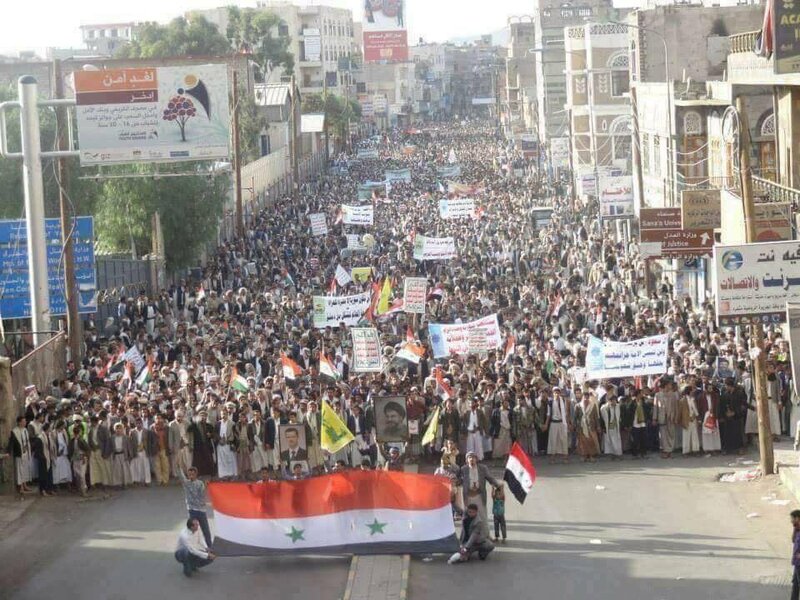 Needless to say, these images will not find their way into the sludge presses of western, Fake Stream Media. side note: this entity has lost every ‘right’ to exist. This is an ominous development, the empire has deployed 5 KC-135 tankers to Lviv International. This will allow empire strike aircraft to assist Kiev in attacking the Donbas……..
Its around 600 miles from the Pole border to Donetsk. Therefore strike aircraft based in Poland will now have range to the Crimea as well. Y’all have a great day. EEEEEEEEEEEEEKKKKKK Achoooooooooo achooooooooooo… danger will robinson danger danger.. Yesterday I was about to taunt Israel about not bombing Syria for quite a while now in a comment, but I was tired and went to sleep instead. Almost fifty gunmen of the US-backed SDF have been killed in different assassination operations in a region between the provinces of Hasaka and Deir Ezzur in the last two weeks, well-informed sources reported on Saturday. There are no Illuminati / Freemasonry groups trust ((( us ))). Its all just conspiracy theory. China hosts Russia, Iran, others for Shanghai Coop (CSO) summit 9-10 June. – Annual summit of Shanghai Cooperation Org. 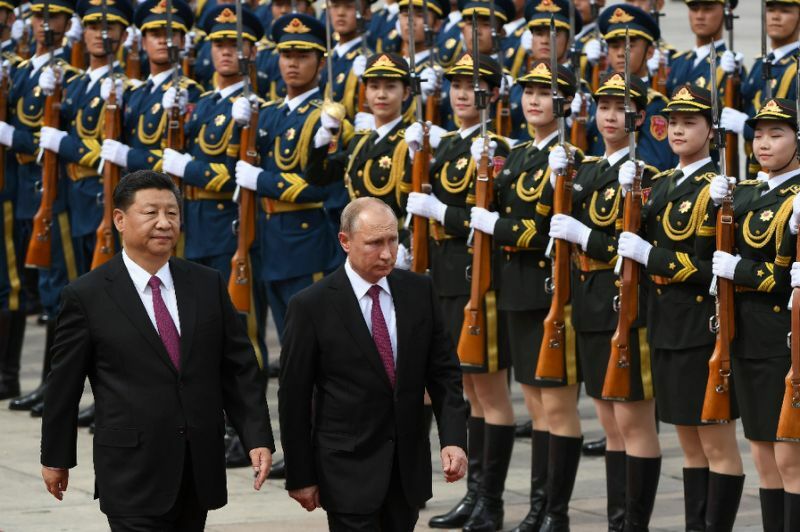 (SCO), a regional security bloc led by China and Russia. Iran an observer member may be elevated to full membership. Also attending > Iran President Rouhani, Pakistani President Hussain & India’s Prime Minister Modi. (Good trend & timing these savvy world leaders together just before Trump in Singapore. Ignore link’s MSM BS, since World Empire’s PTB anti-CSO and 95% negative on both Putin & Trump. Mike). BEIRUT – Lebanon’s Iran-backed Hezbollah will remain in Syria as long as Syrian President Bashar al-Assad wants it there, the group’s leader said on Friday, defying renewed pressure to force Tehran and its allies to quit the country. “I will tell you that if the whole world comes together to force us to leave Syria, they will not be able to evict us,” Sayyed Hassan Nasrallah, adding that only the Syrian leadership could ask them to leave. (the more Lebanon & Syria strongly cooperate the more security & sovereignty for each. Mike).